Several recent methodological improvements are particularly noteworthy.13 One improvement was implemented in 2006. As a result of improvements made to the Current Population Survey (CPS), the estimates since 2006 are able to include all unmarried parents living with their children when determining the eligible population. In previous estimates before 2006, only one of the unmarried parents could be considered in the eligibility determination process because of data limitations. Had the improvements made to the CPS been unavailable for the 2006 estimate, the number of children estimated to be federally-eligible for subsidies would have been 516,000 children14 higher (an increase of about 4 percent), and the percent served would have been 0.6 percentage points lower (16.6 percent instead of 17.2 percent). Another methodological improvement addressed the modeling problem that some children incorrectly appear to be eligible because their families’ incomes drop below the eligibility thresholds solely due to the fact that their parents are ending a period of employment. A new method was added in 2007 which excludes those children with parents that had earnings above the eligibility thresholds before and/or after the temporary period without employment. In these cases, the children are not considered eligible during the month of employment exit. This change reduced the number of children eligible. Another set of methodological improvements were made starting with the 2009 estimates. One of these changes excluded children that were unlikely to be eligible based on citizenship status. In 2009 this affected about 484,000 children. Of these 484,000, about 154,000 would have otherwise been eligible for child care subsidies under federal parameters. While some noncitizen children are eligible to receive subsidies, undocumented children and children living with parents with temporary visas are generally not eligible to receive subsidies. Had these children been included in the FY 2009 estimates the percentage of federally-eligible children served would have been 17.6 percent instead of 18.2 percent with their exclusion. As defined by federal law, citizen children with noncitizen parents are eligible for federal child care subsidies as long as they meet other eligibility criteria. Another methodological improvement was made starting with the 2009 eligibility estimates that affected the number of children eligible under federal parameters. This change included the treatment of income of assistance-unit members other than the spouse, head, and eligible children. Before 2009 older siblings of the children were included in the family count but their incomes were not included. Starting in 2009, the estimates include the older children in the family count and their incomes are added to their parents when determining family income. For purposes of these estimates the definition of the assistance unit is based on the subfamily, as defined by the Census Bureau, and family members outside of the subfamily unit are not included in the benefit determination formulas. It should also be noted that about 237,000 children are defined as eligible in this Issue Brief under state parameters that are not considered eligible under the federal parameters used in this brief. This discrepancy occurs because states vary in their treatment of which family members are included when considering family size and family total incomes. For example, the earnings of an older sister residing in the household are included in calculations for determining eligibility under federal subsidies, but they are not included in the benefit eligibility formulas for particular states that have different eligibility parameters. Another set of methodological improvements include the transition from using the eligibility rules submitted to HHS as part of each state’s biannual state plans to the CCDF Policies Database. 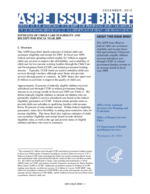 The new CCDF Policies Database includes more detailed information on how states calculate eligibility. For example, the Policies Database provides more detailed information on how states treat extended family members when determining family size, family incomes, and minimum work requirements. They also provide more detailed information on how states treat specific forms of income such as child support, Supplemental Security Income (SSI), and Temporary Assistance for Needy Families (TANF). Based on alternative simulations using FY 2008 data, the effect of excluding ineligible noncitizens and the addition of more detailed eligibility reported in the CCDF Policies Database increased the number of eligible children by 120,000 and 727,000 children under state and federal parameters respectively. The decrease in the percentage of children served was less than 1 percent under state eligible parameters and about 1 percent under federal parameters. Appendix Figure 1 displays the number of children who are federally-eligible for subsidies and the number of children receiving subsidies during the period 1999-2009.15 The number of children eligible under federal parameters in Appendix Figure 1 is calculated without excluding children that are unlikely to be eligible based on their citizenship status, and without including unmarried partners in the eligibility determination process. These exclusions were made to provide a series of consistent, although less precise, estimates to analyze changes in estimated eligibility over time. The trends shown in the graph should be interpreted with caution due to changes in estimation methods, measurement error, and demographic shifts affecting eligibility over time. Some of the methodological improvements described in this section have been applied retrospectively and the estimates may not match exactly the estimates shown in ASPE’s previous Issue Briefs. For reference, Appendix Figure 2 shows the total number of children, regardless of child care eligibility, estimated to have been living in households with incomes below 100 percent and 150 percent of poverty thresholds from 1999 to 2009. *Appendix Figure 1 was estimated without using an alternative methodology that excludes improvements made to the TRIM model for the 2006-2009 estimates. With the improvements, the estimate of the number of federally-eligible children in 2009 is 13.8 million (see Table 1 on page 1).